If you’ve travelled to Plano for an extended business trip, to search for a new career, or to take care of a friend or relative, it can be difficult to know where to stay. While your family or friends might want you to stay with them, it can be hard to not have your own space in which to relax. Maybe you’ve thought about subletting an apartment or staying in a normal hotel but the cost has made you reconsider your trip. Don’t fret, call us at Studio 6. We’re an extended-stay hotel in Plano that is close to three different universities, the Plano Medical Center, and tons of great restaurants and places to shop. At Studio 6, we make it so you can feel like you’re at home even when you’re far away. Our rooms are big and comfortable and each one features a kitchen so you can cook for yourself. In addition to the nice rooms, we also have extended cable and WiFi. Stay with us when you need a place to call your own and read on to learn a few tips that will make your stay even better. One of the fastest and easiest ways to make one of our rooms feel like home is to bring a couple of your favorite pictures with you. You can set them on a table or a dresser for a little splash of home. If you have a dog or cat, they’re welcome at Studio 6! 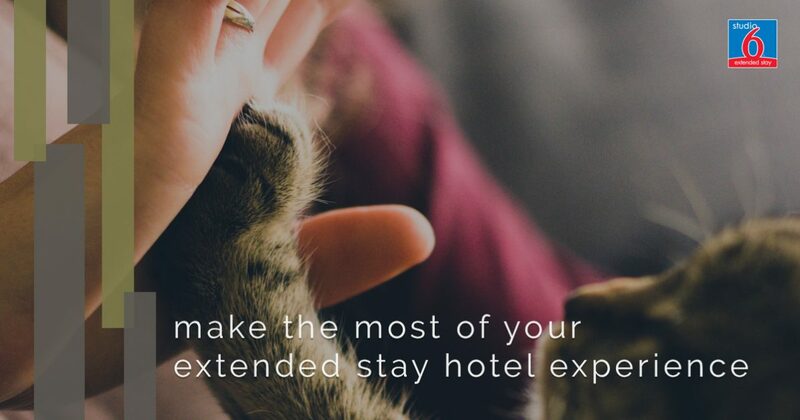 We know how important it is to have your furry family with you when you travel, so make sure to bring them with you. There are plenty of places to walk your dog nearby, which will help you get to know the area better. Relaxing with your pet at the end of the day makes everything feel better, even if you’ve had a tough day or two. Travelling is expensive. In addition to gas or airfare, food is another expense that adds up very quickly. If you come to Plano and stay at Studio 6, you’ll be able to store and cook all of your favorite foods in your own kitchen. Not only will this save you a lot of cash, it also makes your room feel like home. While staying somewhere that isn’t your house will never feel just like home, a lot of hotels leave a lot to be desired when it comes to how you can relax there. At Studio 6, every one of our rooms has extended cable and WiFi. This means that you don’t have to miss any of your favorite tv shows while you’re traveling. Our comfortable furniture makes relaxing even easier. Get in touch with us at Studio 6 today to find out about our rates and to see what else we can offer you when you come to Plano. No matter why you’re coming, we can make your stay more comfortable and fun. Check out our website to learn more about us and the area.